Eventus is a clean and modern event oriented Drupal 7 Theme. 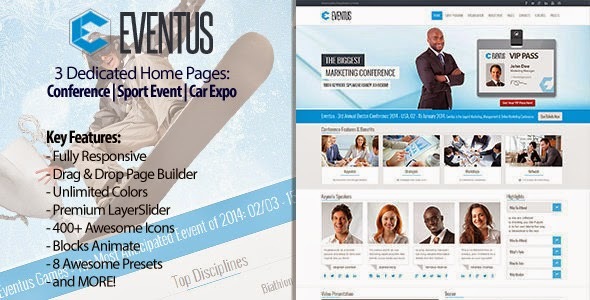 Eventus comes with 3 dedicated home pages: conference, car expo and winter sport event. The template is perfect also for any type of event or business site. Based on Drupalexp Framework, the theme gives many options for customizing with the layout builder and unlimited colors option. Item Reviewed: Eventus Responsive Events Drupal Theme 9 out of 10 based on 10 ratings. 9 user reviews.